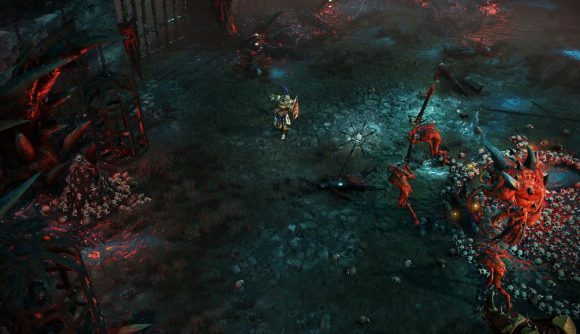 The flood of Warhammer games on Steam in recent years has produced mixed results, but it also means we get to see every subgenre’s take on Games Workshop’s universe. Chaosbane is one of the most promising – an action-RPG that pulls from Diablo and Path of Exile and takes place in the Old World. The setting isn’t its only novelty either – the developer has come up with a rather direct way of fighting your battles. At Gamescom today, Eko Software demonstrated the way a high elf’s area-of-effect abilities could be steered manually. Hold down space after firing a missile or fireball and you can use the mouse to direct pain into the path of your enemies. There’s a different application of this mechanic for every class in the game. For instance, the soldier can manually parry attacks to avoid damage, making positioning a key consideration in a way not often seen in the genre. You can read more in our Chaosbane interview, which should tide you over until our Gamescom impressions – and the game’s release in 2019 beyond that.